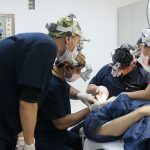 One topic on the curriculum for doctors in the hair transplant training center will also be the CIT FUE Hair transplant technology which was invented by Dr. John Cole. Hair loss treatment has been revolutionized by the CIT® hair transplant, a proprietary method developed by Dr. John P. Cole. Advanced procedures as well as specialized tools represent state of the art advances in hair transplant technology. The CIT® method represents the latest advancement in “Follicular Unit Extraction” (FUE). CIT® advances traditional the “Follicular Unit Extraction” (FUE) procedure of transplanting groups of natural growing hairs. These groups of 1 to 4 hairs are called “follicular units” which are removed from a donor site on the patient’s body and transplanted to the desired location. Dr. Cole’s development of specialized tools like the PCID or the sharpest punch in the industry and skillful removal and treatment methods promote mimimized damage to the hair units and greatly improved aesthetic results. 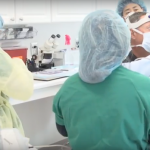 Dr. John Cole offers the exclusive “FUE+” program includes, among others, a minimal depth FUE, Platelet Rich Plasma and ACell therapy and even a non-shaven CIT® option known as the “C2G”. These services bring hair transplant results to a whole new level. The minimal depth FUE uses the Cole Isolation Technique (“CIT”) which allows for variation in punch size and depth tailored to the individual patient. Utilizing Dr. Cole’s specially designed instruments this leads to better control and prevents damage or transection (cutting off) of the hair bulb during extraction. The result is dramatically improved hair growth of the transplanted hair and improved comfort and healing for the patient. Platelet Rich Plasma (PRP) and ACell therapy also provided dramatically improved results over traditional procedures. PRP is derived from the patient’s own blood and release growth factors which stimulate healing and hair regeneration. By stimulating the stem cells which are left in the minimally invasive CIT, donor hairs regenerate as well as superior growth is seen in the transplanted hair. ACell therapy, proven in wound therapy, aids hair transplant patients by stimulating healthy hair follicle growth and tissue healing. With so many advances and benefits of the CIT® and FUE+ procedures, not only patient comfort but the aesthetic result of natural looking hair, Dr. John Cole has brought hair transplant technology to an all new high.